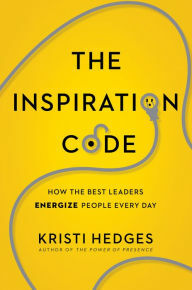 Some call it “charisma,” a term whose original meaning in ancient Greece was “divine gift.” I characterize it as a “compelling presence.” Whatever you call it, Kristi Hedges has written The Inspiration Code to explain HOW to develop it in order to energize others in positive and productive ways. Opinions are divided about its importance of charisma to effective leadership. My own opinion is that it resembles an expensive fragrance: it smells good but don’t drink it. Churchill, Gandhi, and FDR certainly had charisma but so did contemporaries such as Hitler, Stalin, and Mussolini. All certainly had magnetism, the aforementioned compelling presence. Opinions are also divided about another issue but I remain convinced that leaders (even great leaders) cannot motivate another person but can inspire self-motivation in that person. All organizations need effective leaders at all levels and in all areas beyond the C-suite of the given enterprise. Leaders without title become the gravitational center of collaborative effort. I only wish they were more widely recognized and more generously rewarded. Great leaders resemble great gardeners in that they have a “green thumb” for “growing” effective leaders from among otherwise ordinary people. I know of no other thought leader who offers more and better insights than Kristi Hedges does with regard to the process of developing a compelling presence, one that Bill George would characterize as “authentic,” a presence that would correctly indicate the decency and integrity of the person who possesses them. There is an ancient but remarkably durable observation that I first heard from my Swedish grandmother after a third-grade classmate had betrayed my trust. “This time, shame on him. Next time, shame on you.” The code to which this book’s title refers correctly stresses the importance of earning and then sustaining the ability to inspire others. Trust and respect are essential to achieving that.